Saturday February 28th, 9am to 12 noon: volunteers are needed for planting native plants and removing invasive English Ivy along the trail through Milwaukie’s Homewood Park. 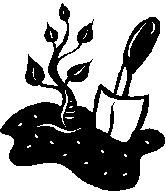 Our goal is to plant 500 plants including Western Sword Fern, Oregon Grape, Vancouveria, and Snowberry. Our February meeting was a short but informative one! The full notes from the meeting can be found here. Linda Hedges told us about Community Emergency Response Team (CERT) training. The Fire Department would like to have a team trained in each neighborhood. If you want to sign up for training contact our neighborhood secretary Linda Hedges, for more information check out the Clackamas County Fire Dist. 1 website. Milwaukie Light Rail: Soon TriMet and Metro will begin work on Preliminary Engineering (PE) and the Final Environmental Impact Statement (FEIS) for Portland to Milwaukie Light Rail. An Open House explaining these processes will be held Wednesday, March 4th from 5:30 to 7:30 p.m. in Fellowship Hall at Rose Villa, located at 13505 SE River Road. More information is available on Tri Mets Website. Jeff Louden from the Hector Campbell PTA told us about plans for the 2009 Campbell Carnival. He asked us to contribute $500 towards the event; we will be voting on this at our March meeting. Homewood Park is nearing completion. Last month several neighborhood volunteers helped spread wood chips on the trail. The next work party is scheduled for February 28th.